The female portrait in the Isabella Room in Spokane’s Davenport Hotel has always been the central focal point of what was originally the hotel’s dining room. Popularly called “Isabella,” the woman in the picture, of course, has nothing to do with Queen Isabella of Spain who enabled Columbus to set off for the New World in 1492. This woman is in the French fashion of the 18th century. Since it is unsigned and there is no record of exactly where it came from, the picture’s age is uncertain. 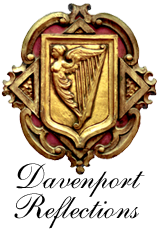 A possible clue came to light during the Davenport’s renovation of 2000-2002 when the painting was cleaned and repaired. By 2000 the piece displayed the ravages of age and neglect. Grime and discolored varnish had given it a murky appearance. Holes in it were rumored to have come from champagne corks shot at it. Crude retouchings to mask areas marred by numerous pinhead-sized paint losses had been done with oil paint mixed to match the brown surface dirt and dark varnish. Before the relatively recent development of non-yellowing picture varnishes, oil paintings were typically varnished with solutions of natural resins, which gave them a beautiful gloss and rich depth to the colors. These resins, however, have the downside of turning brown with increasing age, which in some quarters had given rise to the notion that the Old Masters intended their works to look that way. It was not uncommon for 19th-century restorers to add brown pigments to the varnish they applied to cleaned paintings to give them an “Old Masters golden glow,” as it was called. Some rather fierce controversies arose in the 20th century when beloved old paintings were stripped of their familiar brown tone to reveal surprisingly brilliant colors. In was also not unusual in the past, before the field of art conservation was developed and put on a scientific basis, to use some very harsh means to clean paintings. It is indeed a rarity to find Old Master paintings that have not been messed with in some way, with evidence of over-cleaning and having been painted over in areas. The “Isabella” portrait is one such example. Before removing the old varnish, the painting was taken out of the frame and given a close examination. The holes were filled and spot tests were done to assure that solvents used to take of the varnish would not also dissolve the paint. During the cleaning process, I observed that areas of thick oil paint at the upper left side and top were of a very different texture than that of the original painting and had been applied on top of the dark varnish. The texture and nature of the brushstrokes were that made by commercial tube artists’ oil paint and very unlike the smooth fluidity of the original painting. These over-paintings came off easily with the varnish, to reveal not only the pinhead paint losses but the original detail they had masked. Their ready solubility suggested they had been fairly recently applied. Old oil paint films normally become increasingly resistant to solvents with age. Later in the cleaning process I came upon a rather curious passage. 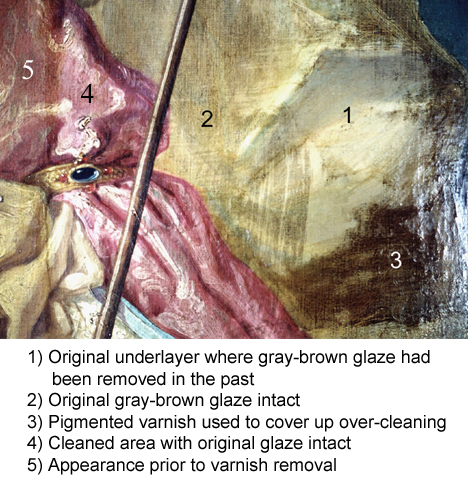 In the drapery behind and to the right of the figure, varnish removal revealed places where an original, thin grayish glaze was missing. This glaze had been applied over the whole figure and drapery. It is a historical technique used in 18th-century French painting. The colors were painted much brighter than the intended final result and then harmonized and softened by an overall glaze, which also added greater depth to the paint. It was plainly original in the “Isabella” portrait because of its degree of insolubility and the aesthetic effect it provided. For example, beneath this gray glaze, the woman’s dress was a shockingly bright pink, which would have been totally out of keeping with the rest of the painting. Evidence suggested that the missing gray glaze sections had come about during a previous cleaning. The coating that was coming off in this area was much darker than the rest of the varnish and this strongly indicated that a restorer in the past had covered over a mistake by mixing brown pigment with varnish. This was further strengthened by discovering this very dark brown varnish in other places, such as shading on the right sides of the lower portions of the woman’s gown. This implied that going over the drapery section with a dark coating also made it necessary to darken other areas, correspondingly. The use of varnish instead of oil paint can be accounted for by the fact that varnish dries a great deal faster than oil colors. Because these brown areas were of the same solubility as the overall varnish, unlike the rest of the paint (including the gray glaze), I concluded they were not original and removed them. 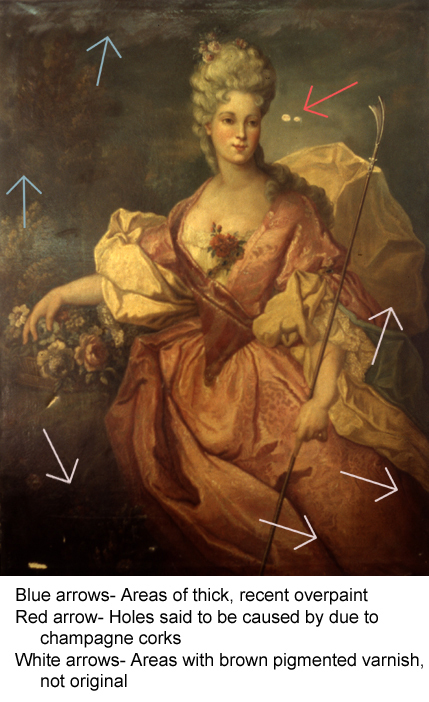 Another finding was in the sky immediately above the drapery to the right of the figure (the red arrow in the illustration). The paint was smoothly blended, unlike the crude, later over-painting, but was of a different color and pattern than the rest of the sky. It was removable with the same solvent, very possibly because it was also mixed with varnish. The fairly sizable area of old retouching in the sky was removed and recreated in a way more in keeping with the surrounding colors and clouds. The missing areas of gray glaze and pinhead paint losses were carefully touched up so as not to overlap surrounding undamaged areas. The picture was then varnished with a non-yellowing and reversible conservation varnish. A much fresher and lighter, more harmonious picture resulted, possibly such as had never been seen since the painting came to the Davenport. The evidence of an old repair job offers a possible clue to the painting’s age. Clearly it was not a new painting when it came to the hotel. A scenario suggests itself. The painting had come to a picture dealer, possibly in France. An unverified report has noted that Mr. Davenport had gone on a European buying trip prior to the opening. Pride of an Empire, the hotel guide book published in 1915, described the picture as being by “Nattier,” which cannot be substantiated, but it is possible that it was sold as a Nattier. 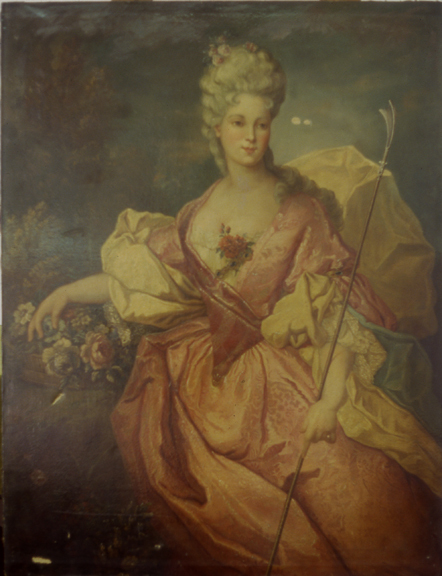 Picture dealers routinely sent paintings to restorers (often artists, not at that time trained conservators) to be spruced up before going to the showroom. Either then or at some earlier time the painting suffered the damages noted and was touched up to make it visually acceptable. The artist’s technique and the look of the paint itself are not typical of the 19th century but of the previous one. It has the typical craquelure of very old paintings on canvas. Oil paint eventually becomes brittle with age. Researchers at the Smithsonian have demonstrated that the crackling comes from the animal glue “size” that was applied to the raw fabric to seal it against the acidity of the oil. This glue size readily absorbs moisture from the air and it is the resulting expansion and contraction with variable humidity that makes breaks in the paint film once it has become sufficiently brittle. Natural resin varnishes, such as the one that was removed here, eventually turn yellow-brown, but this takes time and the implication that varnish was removed once before suggests a date of likely, at the least, 100 years before it came to Spokane. 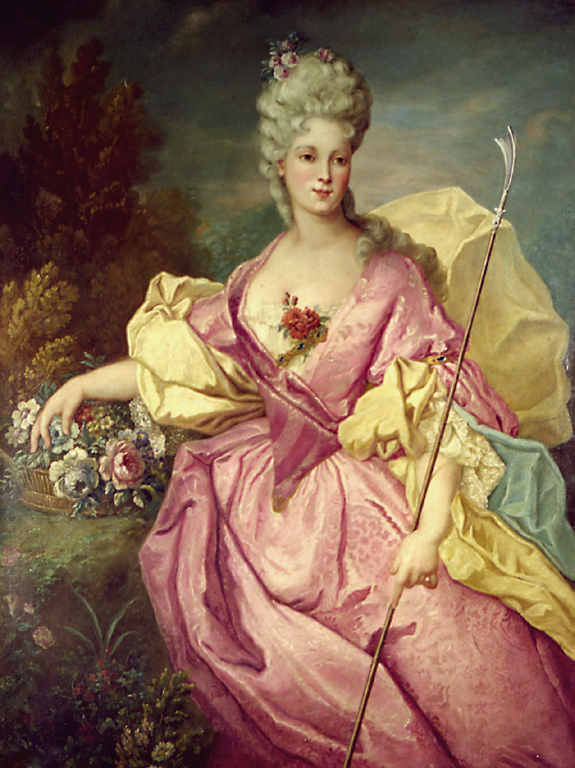 The subject, costume, and overall sensibilities are from the Ancien Régime, well before the Revolution of 1789, and consistent with the style under Louis XV. It is not a masterwork on a par with the great artists of the period but it is very fluently and confidently painted. What I am wondering is, if it is a 19th -century production, as suggested by some who have not seen it, where would a 19th-century artist have learned these techniques, which had largely been abandoned after the Revolution, and why would the artist have executed a subject such as this? All content copyright by Melville Holmes. All rights reserved. Click on the images below to visit our other sites. Please click to visit my professional page.